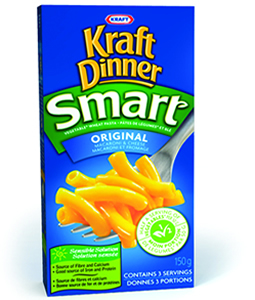 Home > Health	> Does Labeling Kraft Dinner ‘Smart’ Make it So? How funny. It’s been a while since I’ve eaten Kraft Mac and Cheese, but, gosh, I love it. In fact, it’s hard to beat it in terms of comfort food. But isn’t it amazing the impact mere marketing can have on the brain? Great post, my friend. That little boxed dinner devil torments me, too. It is the ONE thing I know my picky kid will always eat. It also happens to be awful for him. Oh the conflict!